This is a case of the author should have quit while he was ahead. 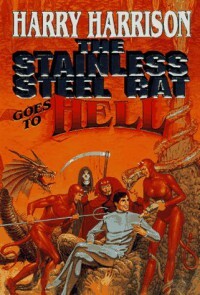 This book was written over 30 years after Harry Harrison started the Stainless Steel Rat series and it shows. I'm into the occasional escapist quick read as much as anyone else but the story line of this book reads like a multitude of rejected plots from B science fiction movies. How off the wall does it get? An attack is made on a universe by going through a garage door portal using a salami as a weapon. At least it won't break as easily as if they had used a loaf of stale bread.I liked all the other James diGriz books better. This was just too silly.If you're new to this series for pity's sake don't start here. Read one of the earlier books first.